Inspired by a childhood connection with horses and The Silver Brumby storybooks she once loved, Elizabeth Denniss adopts a starved orphan filly, Sophie. At the time, she is herself at a turning point in her own life, facing the heartbreak and confusion of a crumbling marriage. Another challenge is the residual impact on her own life of her brother's long term struggle with depression. Sophie bears scars of her own, both physical and emotional. In a quest to obtain healing for the troubled young horse, Elizabeth explores various strategies. Their path is not without obstacles, as Sophie must also overcome a life-threatening health complication. Ultimately, both horse and human learn valuable lessons about each other. 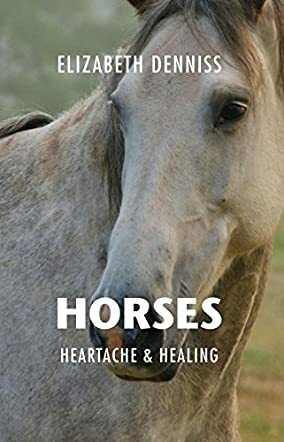 Their shared journey is chronicled in a thought-provoking book entitled Horses, Heartbreak and Healing. A beautiful selection of photographs depicting Sophie and her equine mates is also included. I've always loved horses and this book again reaffirms what special creatures they are. There are valuable insights into the private social lives of horses and how the herd dynamic continues to play a role, even in semi-domestic settings. We learn how horses bond and how trauma can affect them. One fascinating chapter offers a glimpse into equine grieving, when an elderly mare is euthanized. As a guide into the world of horses, the author acts as an empathetic and emotionally aware facilitator. For example, she regards the failure of her marriage - a life-changing event - with mature self-awareness and introspection rather than blame. She is also open to exploring new therapies and in receiving communication, whatever form it takes. I only wish she went a little deeper into certain topics. A glossary, a who's who with short biographies on some of the role players, and a little more background on some of the training programmes discussed might be additional resources. Perhaps a follow-up will be in the offing. Horses, Heartache and Healing by Elizabeth Denniss is set in Australia, and is strongly recommended to any animal and horse lover.